Blame Canada (and weak American corporations, too). Thanks to the many readers who sent me the Windsor Star article about the Hezbollah CBS billboard in downtown Windsor, Ontario, Canada (right over the river from us here in Detroit). The Star is an excellent paper and used to be edited by a friend of mine. I read it regularly, as the same Sharia that is beginning to be instituted here and the same Islamicization we see is magnified ten-fold just a few miles away in another country. An unidentified party paid to post a pro-Hezbollah billboard, featuring photos of Hezbollah leader Sheikh Hassan Nasrallah, as well as other Hezbollah officials. While that is disturbing, it really is not surprising if you’ve ever been to Windsor, especially lately. Hezbollah and HAMAS supporters who can’t get in here, live freely over there. And others who can’t get in here, regularly are smuggled through in car trunks from over there to here. And Hezbollah supporters here have training camps over there. The billboard may be against the law in Canada, where free speech laws are less absolute, but it’s definitely illegal under U.S. law for other reasons. What’s disturbing is that CBS owns the billboard and allowed it to be posted. This is a violation of federal law here in America. It makes no difference that the billboard is in Canada. Federal law prohibits providing material support, including communications (such as a billboard), to terrorist groups. Hezbollah is not only on the State Department Terrorist List, it is also a Specially Designated Global Terrorist Entity by the U.S. Department of Treasury. 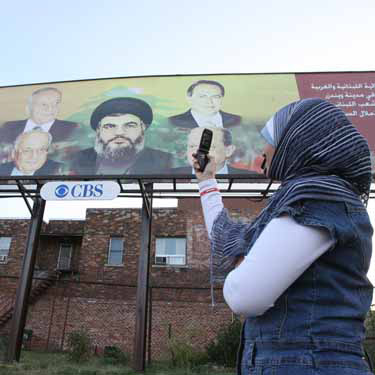 Therefore, with the posting of this billboard supporting Hezbollah, CBS has gone beyond the bounds of free speech and entered the boundaries of illegality. Unfortunately, nothing will likely happen to CBS for doing so. Who enforces the laws? Well, our spineless, wimpy, partial-to-Muslims Justice Department does. They will never pursue CBS for doing so. So, CBS will get away with it. Conceivably, a victim of Hezbollah terrorism and his/her relatives could try to sue CBS over this material support, but it’s a stretch. Such a suit, though, would be interesting because it would force CBS, through discovery, to disclose exactly who paid for the billboard, and let us know exactly who is working for Hezbollah in North America–at least, in connection with the billboard. For now, you can contact CBS and protest this billboard. Ask CBS why they will allow their billboards (and who knows what other media outlets–CBS radio? CBS television network?) to be used as vessels for a terrorist group’s propaganda . . . a terrorist group that murdered over 300 U.S. Marines and civilians in barracks and an embassy in Beirut, almost 100 people in the Buenos Aires Jewish Community Center and Israeli Embassy, and countless U.S. soldiers in Iraq against whom Hezbollah is producing IEDs. And there is another thing not specified in the article. Windsor’s Mayor, Eddie Francis, is a Lebanese Maronite Christian. He is generally a good guy, but he is under pressure from the Muslim community in Detroit, with whom he has broken bread. I’m glad to see he denounced the billboard. For him–a pro-Western Christian Arab in a city with a geometrically-growing Muslim Arab population–that was courageous and laudable. Compared to spineless politicians here, like Michael Chertoff–who regularly visits the open agents and supporters of Iran and Hezbollah–that is a breath of fresh air. Another positive development: The Windsor Jewish community–to whom I once spoke and with whom I have a good relationship–is, unlike most Jewish communities here in America, especially in Detroitistan. They are a small community that fights against the pan-Islamist winds (in Detroit, the Jewish “leadership” embraces and bows down to those winds). They are less liberal and more proud to be Jews and Canadians. They’ve spoken out harshly against the billboard, whereas here in Detroit, the Jews would embrace it as a great thing (so-called Detroit Jewish “leaders,” like Sharona Shapiro, regularly kiss the butts of Hezbollah’s and Iran’s agents and full-fledged supporters here). And for those who keep telling me that most Muslims are against terrorism, please tell me why every Muslim intervied by The Windsor Star praised Hezbollah. Most Muslims may not be involved in terrorism. But most Muslims actively cheer it on. Wake up, Dhummis (not you the readers of this site). Members of the Jewish and Lebanese Christian communities in Windsor are outraged by the appearance of a billboard that appears to promote Hezbollah — an organization the Canadian government considers terrorist. Located at the southwest corner of Marion Avenue and Wyandotte Street East, the billboard does not mention Hezbollah by name, but features a central image of Hassan Nasrallah, the leader of the controversial political and military group. . . .
Emile Nabbout, president of the Windsor branch of the Lebanese Christian political group Kataeb, said he also thinks Hezbollah is a terrorist organization, and he feels the billboard creates a misconception of the views of Windsor’s Lebanese community. “We really are not in support or in favour of that billboard and it should be removed ASAP,” Nabbout said. . . . “By just analyzing the picture, there is no doubt in my mind this is a Hezbollah activity,” he added. But Nabbout said that Arabic writing which appears on the right side of the billboard does not match the English translation. According to Nabbout, the Arabic writing makes a reference to fighting. Francis said he has no idea who was responsible for the billboard, but the city is now looking into whether its content violates any rules. . . . According to [Muslim Windsor resident Sam] Ali, the accusations that Hezbollah is terrorist are untrue. “Hezbollah is freedom fighting. Whoever calls them terrorist is a liar,” he said. . . . Fellow Lebanese native and Muslim Ghina Maawie said she doesn’t understand why anyone would be offended by the billboard. “When I saw it, I felt so happy and so proud of it,” she said. Does they sound like “peaceful” Muslims to you? O, Canada, whatcha’ gonna’ do? YES, I WATCHED IT AND WAS DISGUSTED AT THE PANDER-FEST. I PLANNED TO POST ABOUT IT TOMORROW. Bet the people who rented the billboard to the rats only saw the colour of their money! Oh! how the rats in the hidey holes they infest are laughing at the gullibility of the Canadians! Almost related–the putative winner of an English horse-racing Classic in 2008 has been given the name of one of the 7/7 tube bombers–Tanweer! This billboard makes me livid, but not surprised. Canada is just like Sweden, the U.K. or the Netherlands. Totally dhimmified. Windsor is right across the Ambassador Bridge from Detroitistan and Dearbornistan. No wonder the mobots are spreading into Canada from there to here. The Ontario legislature buildings were the site of an “islamic art” portrayal just a few weeks back. Not a whimper of a complaint (except my me). After all we MUST accommodate all “cultures” as they are equally valuable, right (dripping sarcasm) I need a drink. My first thought was to deface the billboard in some manner. Back in the day I could see drawing mustaches, horns and missing teeth on the subjects. OK, that was just a flashback, of sorts, from a miss spent youth of bawdy pranks. I would hope this billboard would be confronted with another billboard celebrating the IDF, who are fighting and maintaining peace in the region. Your pic of Nasrallah in his tutu and lipstick with him pasting a big wet sloppy kiss on Yassir–flying imams in the background–flying in mid air and a nice moon and star of course. Caption: Hezbollah and Co–Coming soon to your neighborhood!! So, what’s that word? My guess is that it’s “qatl”. Does anyone know? Is there a site that clearly shows the Arabic? BTW, qatl is one of the many Arabic words for “kill”, and it’s used many times in the Qur’an. eliXelx, you’re kidding about the naming of the horse. Please tell me you’re kidding. Oh, you’re not kidding. I was unaware that “The Plague” had spread into (the once) very Canadian city of Windsor Ontario. How revolting! looks like a nice big target for some paint ball practice. We have to stop letting muslims on this continent. We have to start deporting them, now. No doubt the islamists are testing our resolve. One could not help but notice their not so subtle threats and bullying when confronted if someone should take their disgusting billboard down. cliff, it’s not ‘islamists’, it’s all muslims. Maybe that’s what you meant, but they ALL want to take over the world, by force and by having 6 or 7 kids. They won’t stop until they succeed, or we stop them. I got wind of this thru Arutz Sheva, living two hours west of Windsor its quite shocking but not surprising. CSIS and the RCMP won’t even think of opening a file on this. These ‘people’ have their rallies and so forth and no one dares to stop them … so is it any wonder that this happened. Debbie, stop by the London JCC again, we would love to hear from you. Israeli Apartied week at U of T this year is a prime example of the dhimmification of Canada. This billboard is the first round, wait til’ you see the next one. I won’t stop until ‘they’ are all rounded up and expelled from this country. Spineless leaders Jew or Non-Jew succumb to this nonsense … has to stop before its too late.